Please refer to our stock # TI10008 when inquiring. I havenever seen another necklace even close to this one in style. The seller thought it was amber, but I think it is copal - a much newer amber that mainly comes from Africa. It is 24" long and the large pendant is 1 1/2" in diameter and 1/2" thick. 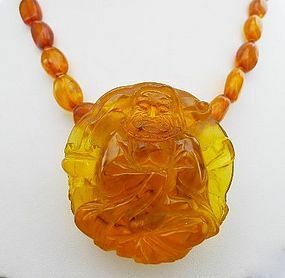 Mounted on top of this pendant is a beautifully carved Buddha - very detailed. The beads are elongated and the necklace is about17" long. One of the beads in the back unscrew from the one next to it to make a clasp. I think the necklace i likely a product of Tibet. Whatever, it is gorgeous and very unusual. It has no marks of origin.